Utica, Mississippi never had a significant Jewish population until the founding of the Henry S. Jacobs Camp in 1970. A few Jewish merchants had stores in this rural town in southwestern Hinds County, but there was never a congregation or other community institutions. The roots of Jacobs Camp go back to the 1940s, when a group of parents in Mississippi began to work to create a Jewish social life for their children. Celeste Orkin created a temple youth group for Jackson’s only Jewish congregation. Orkin had connections to other congregations throughout the state and region through her involvement with sisterhood. By the early 1950s, she and other parents had created a statewide network of youth groups called Mississippi Temple Teens. Eventually, the group grew to encompass Memphis and Arkansas. By the 1960s, the group became a part of the Reform Movement’s National Federation of Temple Youth, gaining the name SOFTY, and including Louisiana as well. ​Orkin and other community leaders were closely involved in national Jewish organizations. They attended UAHC biennials, where they heard about the union’s nascent camping program and the success of places like the Union Institute camp in Wisconsin. They were influenced by the growing Jewish camping movement, which saw a summer camp experience as a vital way to ensure Jewish pride and continuity. These issues were especially relevant in a region where Jews were a tiny minority, and the culture was overwhelmingly Christian. In April of 1959, 26 people from Louisiana and Mississippi gathered in Monroe, Louisiana to discuss the creation of a Reform camp for the Deep South. Celeste Orkin was president of the fledgling organization, known as the Camp Association of Southern Temples, or CAST. 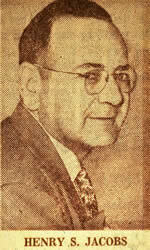 Henry S. Jacobs, the administrator for Temple Sinai in New Orleans, was the secretary. They estimated that they would need to raise $175,000 to build a camp, and soon began to organize fundraising efforts. Members of SOFTY were a major factor in the camp effort. Each summer, there was a week-long SOFTY camp held at various rented facilities across the South. During their regional meetings, or conclaves, youth group kids would hold demonstrations in favor of the camp, chanting together “we want a camp” to convince the adults in the region. Youth groups also worked to raise money for the camp fund. The temple youth group of Cleveland, Mississippi sold specially made SOFTY stationary. Baton Rouge teenagers sold sweatshirts. Others held car washes. Vicksburg’s youth group had a very successful effort selling cigarette lighters with “SOFTY” inscribed on them for $2 apiece. By June of 1965, temple youth groups had raised almost $3000 for the camp fund, which was 38% of all the money raised to that point. Despite these efforts, the camp campaign languished. CAST was run on a shoestring budget, and meetings were discontinued for a while to cut down on expenses. The early history of CAST is filled with these stops and starts, of big, successful meetings followed by months of inaction. By October of 1965, they had raised over $12,000 to purchase 155 acres in Utica, Mississippi which was centrally located between Memphis and New Orleans, the two largest cities in the camp’s region. They decided to change the name of the camp to the Henry S. Jacobs Camp, in honor of the early CAST leader who had recently died. Once the land was purchased, work began in earnest to raise the money to build a camp, estimated in 1966 at $350,000. The idea was to assign to each Reform congregation in the region a quota of $50 per member family. Each congregation could decide how best to raise the money. When construction estimates were greater than expected, CAST increased the amount asked of each congregation. By the end, almost all of the congregations met their fair share, even the large temples in Memphis and New Orleans, which together constituted 50% of the expected quota. Temple Israel in Memphis even raised their donation to $100,000. In September of 1969, CAST was still short of their goal, but decided to borrow the last $125,000, and entered into a contract with a builder to construct the camp. By May of 1970, the camp was completed at a total cost of $398,000, and was turned over to the UAHC. Rabbi Sol Kaplan was the camp’s first director. He hired a recent college graduate as his administrator, Macy Hart. Hart had been raised in Winona, Mississippi, where he became very active in SOFTY and later served as national president of NFTY. By the second summer, Macy was named the director of the camp at age 23, a position he would hold for 29 more years. That first summer, 93 campers came to Utica, which was less than capacity but impressive considering the camp had no track record and was barely finished in time for the first session. By 1972, 296 campers attended Jacobs during the summer. Filling the beds was a region-wide task, with the camp director and his assistants fanning out across multiple Southern states, stopping in every small town where there were Jewish kids to convince them and their parents to come to the camp. Despite the challenges of launching a new camp and particularly reaching small-town families, the camp was almost always filled to capacity throughout its first decade. Over time, there was a shift in where the campers came from. In 1972, 38% came from Memphis and New Orleans, by far the largest two Jewish communities in the camp region. Thirty percent came from small communities. In all, campers came from 39 different communities, including such small towns as Marks, Mississippi, Dumas, Arkansas, and Alexandria, Louisiana. Already by 1975, almost half of the campers came from Memphis and New Orleans. Places like Meridian, Clarksdale, and Vicksburg, Mississippi saw sharp declines in the number of campers they sent to Jacobs. The early 70s was the last time these communities had large numbers of children. Since then, their congregations have shrunk as most of the children raised there have moved to bigger cities in the South and beyond. The camp has had a significant impact on Jewish religious practice in the region. Jacobs Camp introduced these Reform Jews to such practices as Havdalah, singing the Birkat Hamozon after meals, and using more Hebrew prayers during Shabbat services. Campers were also exposed to things like kippot and tallit that were foreign in many of their home congregations. According to Rabbi Lawrence Jackofsky, the longtime regional rabbi for the UAHC, many of these campers returned to their congregations and became dissatisfied with the classical Reform style of worship, and as they grew older began to exert their influence on the liturgy and worship services of their congregations. The camp helped lead the way as many Southern Reform congregations embraced more traditional elements in their worship. In 2000, Jonathan Cohen became the director of the camp, which attracts Reform Jews from Mississippi, Arkansas, Louisiana, west Tennessee, and Alabama. The camp has to attract 25% of the eligible children in the region to fill its beds. While this has always been a challenge, it also means that the camp has a significant effect on a quarter of the region’s young people. Thus the impact of Jacobs on the region is more direct and visible than other Jewish camps. Most Reform Jews in the region feel a pride of ownership and a strong sense of connection to it, because the camp was built by every congregation, not just a handful of major donors. For over 37 years, Jacobs Camp has served a region that does not have a single large Jewish community. Many of its campers come from small cities and towns. For them, Jacobs Camp is a Jewish oasis. It provides a Jewish world that just does not exist for most campers during the rest of the year. As the Jewish communities in the camp region have evolved over the years, with several small congregations closing, Jacobs Camp has remained a center of Jewish life in the Deep South.